Jordi Rabasa was the competition manager for the motorsport division of Derbi motorcycles. He then went on to form the Catalan motorcycle brand named Mecatecno. This was an important role for the company as the good performance of Derbi motorcycles in competition would reflect in good motorcycle sales. This role would take Rabasa all over the world. 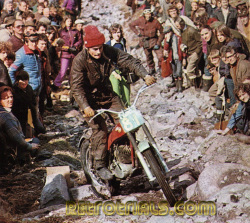 At this time Derbi was successfull in Grand Prix racing and motorcross.Jordi Rabasa was the cousin of Andrew Rabasa who was the director of Derbi. Jordi was young and saw an opportunity to work for himself creating the motorcycles that he wanted to make. He would use the experience he gained from Derbi and steer his company Mecatecno in the direction he wanted. 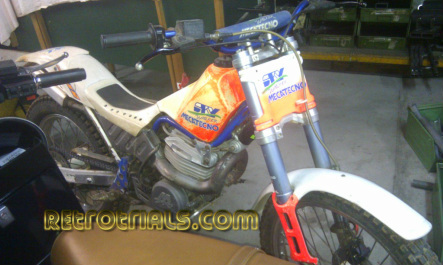 Derbi were a major manufacturer or small capacity motorcycles and Mecatecno were created to compete in this niche. Jordi Rabsa left Derbi is 1978 and established Mecatecno. Jordi lives in the same house he was born in and where Mecatecno was born. 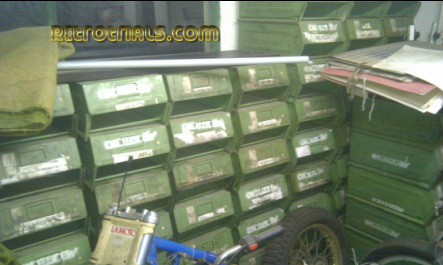 Here are some photos of the workshops where it all began , and where a lot of the machinary and parts bins were brought after the company sadly finished trading. 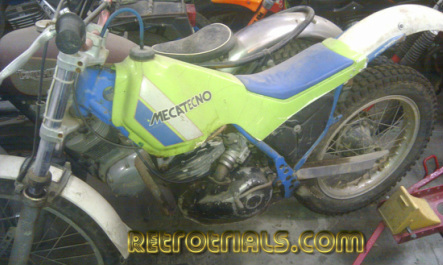 Mecatecno dissapeared from the Trials scene in 1990 and so tracking these down these men in Spain wasnt easy. Ive spent perhaps 4 years trying to find them , the later years keenly. Finally it all clicked together and through a lucky break i made contact with Juan Ruiz earlier in 2011. 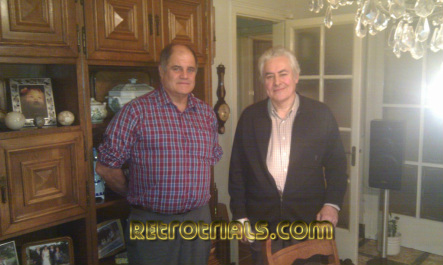 He is such a nice guy and provided me with the information which forms much of the basis of this Mecatecno section. 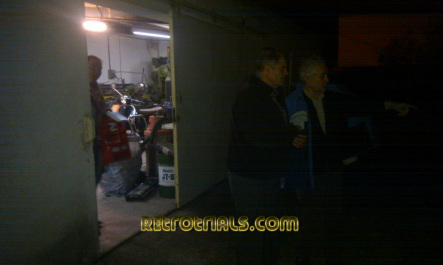 Juan also arranged a meeting with Jordi Rabasa the Mecatecno owner for December 2011. I arrived at the locked gateway to his house and Juan made a quick phone call. A few minutes later a man appeared at the steps and gateway. Jordi led us up old stone steps to his detached provincial house up on the hill with far reaching views. I could see behind the house that the garden sloped up at the back to the brick outbuildings that i knew Mecatecno had started in , back in 1982. Jordi led us through the double opening front oak doors into the high hallway with impressive high ceiling. We then went into his dining room where he offered me a seat.We were both nervous, i was and i could tell he was also. Once he had settled himself on oneside of the table with Juan ,looking over at me , he said "So why are you interested in Mecatecno?". The thought rushed through my head that he was suspicious of me. Maybe he thought i was there sniffing around on behalf of creditors, maybe he thought i was just digging for trouble. I dont know , but he wanted me to clarify why i was there. I explained where my interested came from , the people behind this and my love of the design of Mecatecno and the design and times behind it. It was at this point that i immediately saw the reason why Jordi was the owner of Mecatecno. I saw him look up at the light over the table and i saw a real passion come alive , that was still burning. Jordi said "I remember being at the Spanish trial in Valencia. It was the morning of the trial. It was hot and the sun was bright.I was standing on the side of a mountain looking down at the bike of Gallach. Everyone was watching him and watching this new bike. The sun was shining off of the paintwork and i remember being so proud of that bike. It was wonderful, the colours ". Without Jordi Mecatecno wouldnt have happened. It was his dream. Meeting with Jordi Rabasa 3/12/11 5pm -Barcelona. From 1972 i begin to work at Derbi until 1978.Derbi is a fantastic place to understand the industry and all the construction of the bikes because in Derbi the design process the ambiance was such that it felt like a large family. One person have one idea , he can say to and explain his ideas to anyone. It is open to everyone. I am family bit I start with no experience , but i race with Montesa in Trial. What did you do at Derbi? I begin with the office of the research and development making prototypes.I worked in the development and design of the 75cc motocross machines so that Derbi could enter the Spanish motocross championship. When we were in the race i helped with everything ,but at the factory it was a more management role. The family Rabasa started and ran Derbi for many many decades. How did that help you or cause problems for you?. No help. 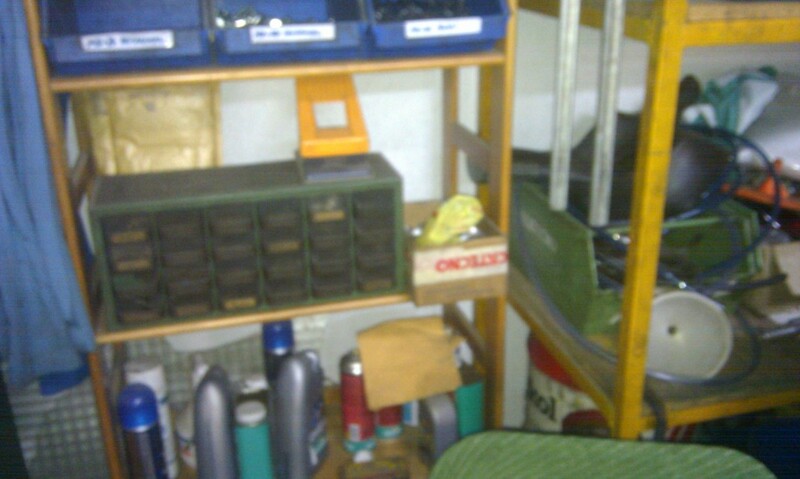 When i worked it was another place in the factory i get no help from them. I had good relationship with Derbi , but they did not help me especially. When i leave Derbi for Mecatecno the relationship was also good. Why did you think to leave Derbi. I leave because i wanted to make something by myself. I like motorcycles. I had ideas to make mini bikes for kids. I was thinking about leaving for 1 year before actually going. I was passionate about the Trial bikes. One person has a vision and wants to make his perfect motorcycle , but my vision was really only to make the childrens motorcycles. I did this at Mecatecno for 4-5 years . Did you make any of the childrens motorcycles before you left Derbi? No i have the idea , but i didn’t make anything. I leave derbi in the Summer , July and it was a race to get the bikes ready for Christmas. It was hard but we did it. Yes , the bikes were made here. Yes, this is the house of my father but when i marry i live nearby for 10-12 years. When my mother died i came back here. Did you make the children bikes because you saw an opportunity here. The market was only for the Italian bikes , LEM , 2 or 3 Italian bikes only. If they make in Italy and sell here , we can make here and sell here. We have to import the engines from Moto Morini. They were the solution to enable us get the engine. The problem was that we had to give them months notice of amount of engines we needed. 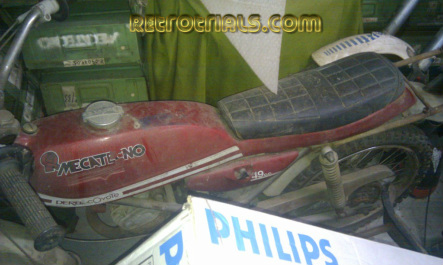 Also in the final days of Mecatecno Moto Morini turned into a big problem for Mecatecno. In Spain we made 50cc Scooters for young people were only allowed 4 speed gearboxes . In one moment the legislation changed to six speed engines being allowed .Moto Morini had a prototype of a 6 speed engine but it never made it into production. All the kids in Spain wanted 6 speed bikes. 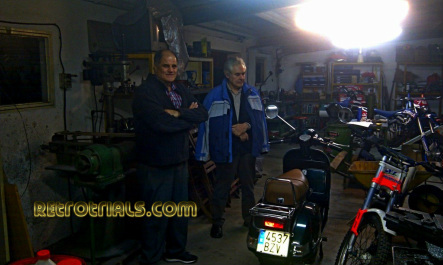 Mecatecno couldn’t buy engines from Minarelli as they had an agreement with Reiju motorcycles. We spend 3 years without a 6 speed engine which was a huge problem for us. Not much money , but we can live one day at a time. The motorcycle is 100 years old. It is very difficult to make money with the moto . the market price is not my decision it is the decision of all of the market. Before i make the moto i know the price to make the product. The cost of the product is the same for all of the companies. If i buy the front suspension it is the same price for Derbi as it is for Reiju. The numbers make the difference. If you make 20.000 this is the difference. You then decide to go the factory at Els Xops. Why you go there? We go there in summer 1982. 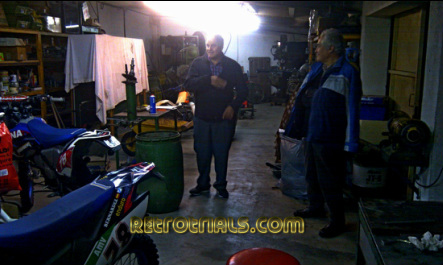 The special bike you make for Marcel Cochs , you make here or in Els Xops. We make here. It was a fantastic bike. It was like a fantic but more power and much more agile. Did you make the chassis yourself ? Would make the Mecatecno logo , who design? I say one thing , i am not the best designer or the mechanic but i put around me a good team. I got the best people to do the job. The logo was made by a friend. He made kitchens, interiors and Mecatecno. He was a painter and sculpture. 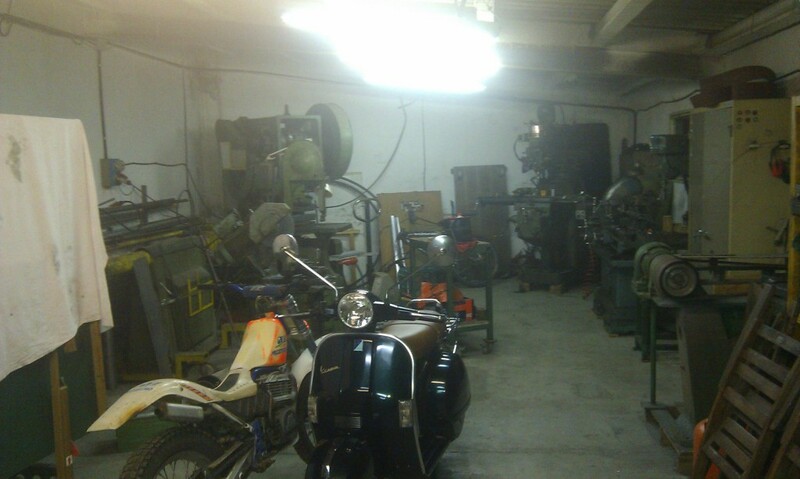 The factory was just one floor for 2 years and then after 3 years the men who made the chasis for the children’s and adult motorcycles gave us problems. They were always late with the deliveries. We decide to make ourselves. We then make a 2nd floor . We put steel girders down making the floor with wood on top. We have stairs to go there and an electric elevator at the back of the factory. 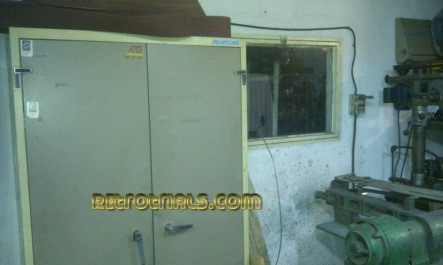 On the ground floor we made the frames and later we make the plastic components using our machine. All the welding was done on the floor. On the first floor we assembled the bikes on a small assembly line on the ground floor. It a moving line but we could stop it when we needed to. There were 5 stops on the assembly line. How many people were employed at the factories busiest point. About 19- 20 persons. When we made the trial bikes it was impossible to move. There were frames and things everywhere. We made the forks for many of the children’s motorcycles. On the first floor the engines were assembled by one person. The engine of the trial bike has its own history. It was our first engine. It was very, very difficult. For the Skywalker it was easier. Why you decide to make the engine?. Was it your decision ? When we design the first engine we design a very small engine , maybe 250cc with a long stroke. At the finish it is all different. Not little engine , was bigger , not longer stroke , all change. I remember the first engine was drawn with the gearbox with 4 gears with another shaft with another speeds. We can change the low and high speeds to give more gears. This is very different. We decide not to do this and make more normal. When we draw the engine we decided on more power for motocross for the future perhaps. At the time it was difficult to make all of the parts needed. Now it is more easy to make small quantities. The machines are controlled by computers and can be changed easily for another gearbox.20 years ago all the machined needed changing and it was difficult. Did all 3 of you design the engine together? We all decide how to make the engine but Mira drew the design. He was from Derbi , he was the chair of the design operation at Derbi.In Derbi in the 60’s the chief designer was Victorian Martine. In one week he draw the racing engines, fantastic. Mira was at that skill level but still good engineer designer. Did the cranks come from Metrakit? The first no ,Moncesa from about 20km away. All parts from the engine are one history from ourselves. The piston one history, the crank one history. 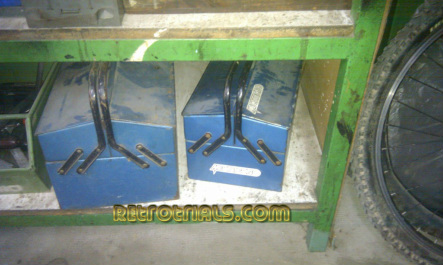 We wanted to make the engine, we did not want Rotax. How long did it take you from the time you had designed the engine to the moment of the first engine? We engineer each prototype completely ourselves. 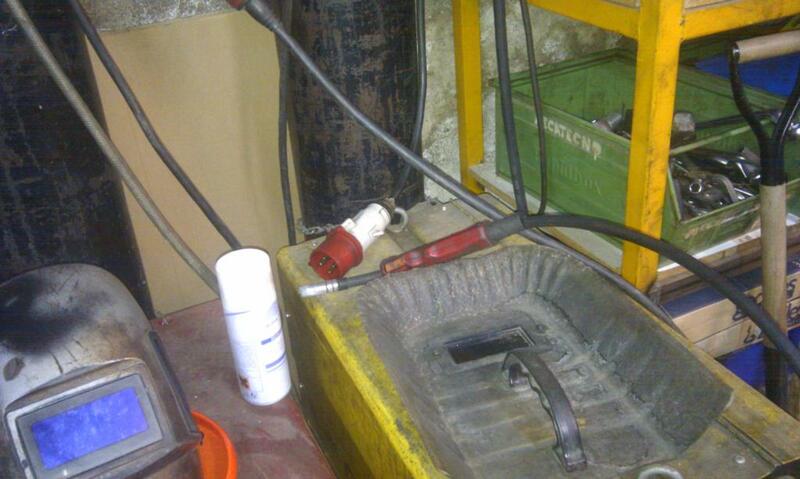 Only the piston we buy and perhaps the spark plug – laughing. The piston was from a Maico motocrosser. Who made the magnesium engine casings ? They also made the wheel hubs but we would complete all of the machine work on the prototypes. 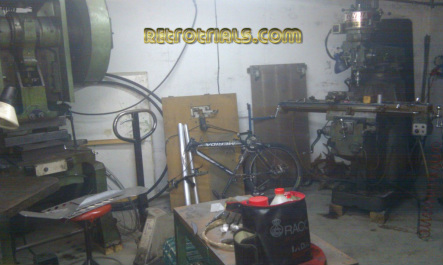 In production the suppliers would complete this Process and we would assemble the bikes. It was the design of the team. During the first design of the engine it is necessary to find a system to attach the frame . The engine is heart of the frame in the Mecatecno. 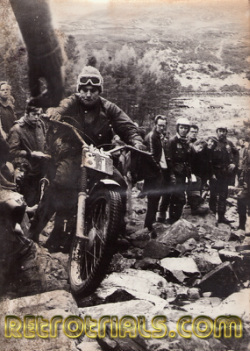 All of the history of the trials machines is very complicated. The starting point is the bike we made with the Fantic engine. The process to decide how we must make the bike is very hard. Why we made the engine part of the frame , i don’t know. Trial bike is good if it is done in a certain way. It is about the position of the weight and the steering and suspension. If the frame is aluminium or steel one design or another is nothing. The concept was to make something different with a technical reason.For example the purpose of the first trial bike was for all of the frame to be very strong , light and agile. With the years , we cannot make it with another material. Why the first we paint green. I don’t know. Maybe because we see the Kawasaki.The Dragonfly , we need to break with the first model. It was a little heavy and one way to do this was to make an optical impression and change the light and paint and frame. 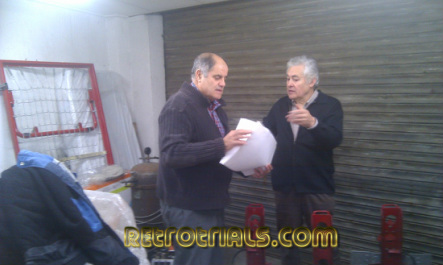 We make prototype with fibreglass but afterwards the production ,no. Gallach’s bike was fibreglass and was different slightly. The production model was in plastic. We made the mudguards on the motorcycles ourselves many times, but not all times. Sometime we ask company to make mudguards of our design. They make the moulds. Did you make the moulds? We ask a company. When we made the plastics ourselves we made the moulds. Sometimes the specialists made the moulds. We made some errors i think , but a bigger problem was the situation in Spain at the moment because we sell in 1992 2000 machines and the next year we sell 300.Why ? The reasons is because in 1992 we make the Olympic Games in Barcelona, we made the universal Expo in Sivila and the government after these 2 event s was in a bad situation. Our money the Peseta was devalued. The people here don’t buy anything. For us it is very hard. It is not a principal for the sellers. The principal product is Derbi and they the dealers were full of Derbi or Bispenas and they don’t want to buy our bikes. The depression is one year and our product was good and we sell 2000 and the next year it is the same. 3 /4 years the same. In each country you know your history and its difficult to translate in another. Here was one moment terribly hard. Derbi is 1992 sell 84,000 motos. Th next years they sell 25,000 motos. A big reduction in one year. It was down to the state in out country. Nothing was selling. The change of the legislation was in 1993 , another bad thing. Derbi buy the rights to make the 70cc Cagiva and they sell but in 1992/3 they sell nothing and they have thousands of bikes in store. They say to the government please change the legislation so that we can sell these bikes with 6 gears. The government change the legislation. In the same moment when the market go down they don’t sell the bikes , what can we do to sell this stock. It is all a consequence of the downturn of the market. Another problem was with the smaller bikes. In 1985-1986 mountain bikes became more popular and they were cheaper than a motorcycle. We have some problem with the Mecatecno CR7. After 200km the piston ring broke and caused damage to the engine. The problem was not our making , but this was first 1000 CR7. We made the last mini bikes in 1997 in Els Ops. We spent another 4 years of more making steel product . 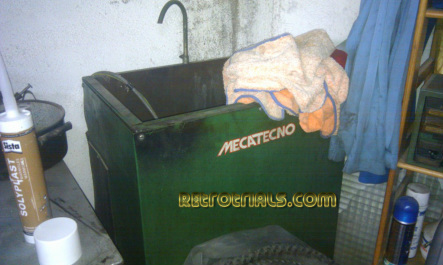 After we closed the door we make one more model of Mecatecno with Ramon Mira with a 4 stroke engine from Piaggio. We sell 3 hundred bikes i think. The men who made possible was in trouble with his own work. It was a very good bike , a mini bike for children. I have many photos of the motorcycles. Did you enjoy your time with Mecatecno ? Very much,it is my life. The last moments he forget. It was time with incredible hard to work but there was great satisfaction to make something like this . we made our dream. I don’t know , all the trial bikes we made 400. Maybe more Skywalker than Dragonfly. Did you loose a lot of money? Yes , many thousand over 5-6 years. From 1993 to 1998 i loose the money. I hope things get better and things turn around.